Food for Friends Ltd ~ Professional Catering For Any Occassion or Event. Using the experience gained from over 20 years of providing the very best service through our restaurant we can now bring our gourmet foods and menus to your event, large or small from an intimate dinner to a large wedding feast. All staff are highly trained and share our passion for good food, wine and high standards of service and all the dishes, as with our restaurant, are freshly prepared with the best ingredients. 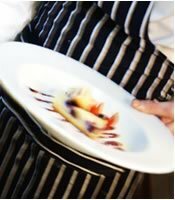 We can look after all your catering needs from service staff, crockery, cutlery, glasses to tables, chairs and kitchen equipment, even a cocktail bar person.